Trainer Cup has a one-piece, spill-proof silicone spout valve that makes sipping easy for tiny mouths, and is also removable for easy cleaning. 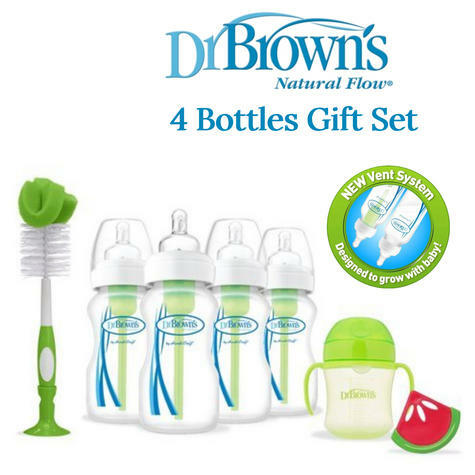 Dr Brown's Bottles, Trainer cup and Watermelon Teether are all top rack dishwasher safe. Inside the box: 4 x Dr Brown's 270ml Anti Colic Bottles, 1 x Dr Brown's Soft Spout 180ml Trainer Cup, 1 x Coolees Watermelon Teether and 1 x Dr Brown's Green Bottle Brush. The Dr Browns Options baby bottles feature a unique system with a removable vent designed to create a vacuum free environment. Introducing the complete new feeding system that grows with baby and help alleviate the symptoms of windy colic. Giving parents the power of choice! The same trusted bottle, with added benefits. 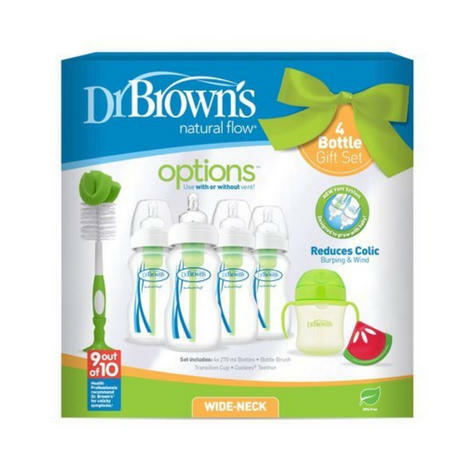 Trainer Cup The Dr Browns Soft Spout Trainer cup is the best way to help baby make the easy transition from bottle to cup. This transition cup now has sturdy, contoured handles that make it easier than ever for little hands to get a comfortable grip. 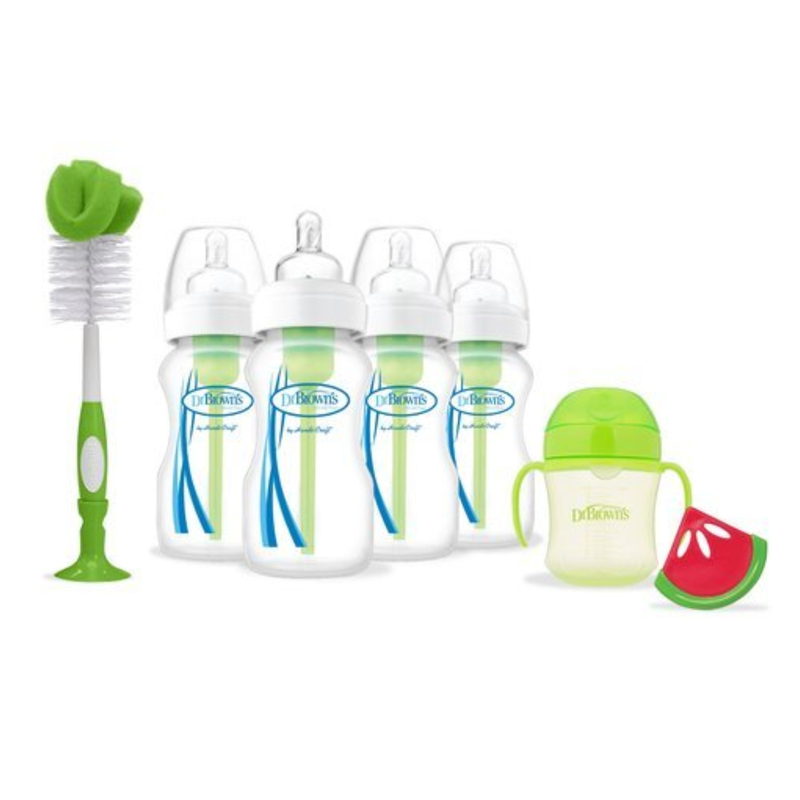 Features a one-piece, spill-proof silicone spout valve that makes sipping easy for tiny mouths, and is also removable for easy cleaning. Attached lid stays open when baby drinks and keeps spout clean when not in use. Watermelon Teether The Dr Browns Coolee Watermelon Teether reaches all parts of the jaw to provide cool, lasting comfort to gums. Ideal for front and back teething, this solid, flexible teether is BPA free, freezer safe and stays cool without a liquid filling. Cleans easily and is designed for babies ages 3+ months. Buy with Confidence from a Dr Browns Authorised Dealer and All Purchases come with a VAT Receipt.